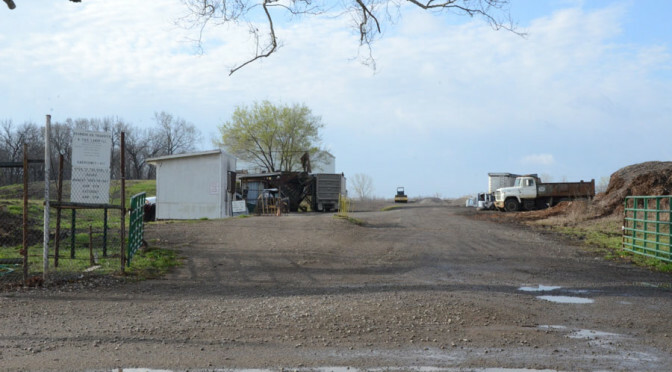 With the arrival of spring, the Bourbon County Commission decided Tuesday to hold a spring cleaning event for the county, encouraging residents of Bourbon County to take their trash to the landfill at no cost on April 22-23. 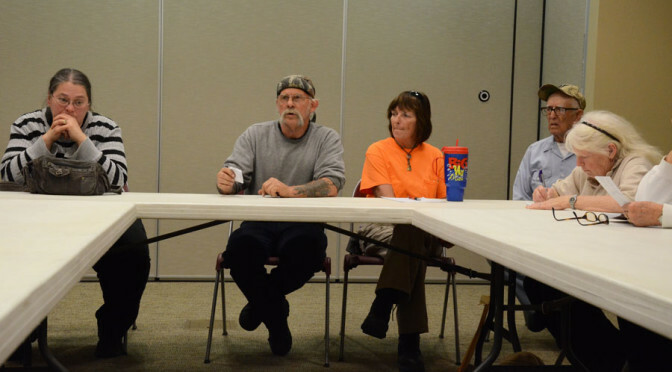 County commissioners discussed with public works director Jim Harris the issue of trash and large items such as tires and even mattresses being abandoned along the sides of the road throughout the county. To try to counteract that problem, and in honor of Earth Day on April 22, Bourbon County residents will be able to drop items off for free at the dump. 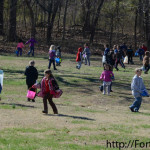 Harris said the county used to work with the local schools on Earth Day when students would clean up areas of town, transporting the trash to the dump. But the county has not participated in recent years. Harris said emphasizing such an event might discourage residents from throwing items away on the side of the road instead. Each day, Harris said employees of the road department have to spend time picking up trash when they should be working on the roads, costing the county and taxpayers money that could be put to better use. All normal rules apply to the special event concerning dumping, such as not permitting paint, oil or batteries to be disposed of there. Other items such as tires, appliances and other objects, which normally are charged according to weight, will be accepted from residences, but not commercial businesses. 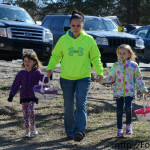 The landfill will be open Friday, April 22, all day and Saturday, April 23, until 2 p.m. 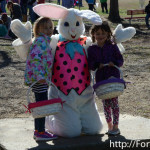 The commissioners said they hope to hold such events more than once a year. 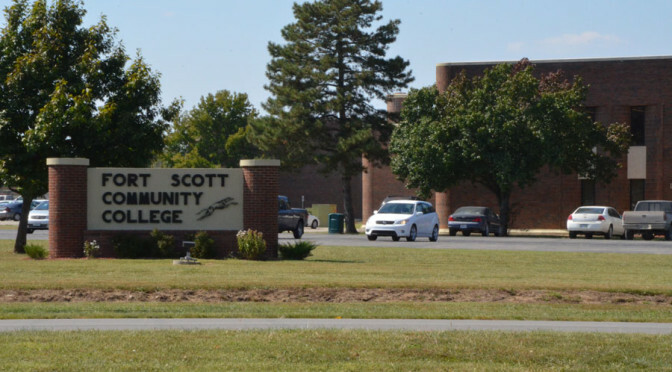 With the approaching end to public transportation provided by the Southeast Kansas Community Action Program, a group of Fort Scott residents formed a committee to look into other options that could accommodate the needs of the city. 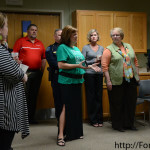 In a meeting held Monday evening, this Community Transportation Committee—made up of representatives from the city, area churches, Mercy Hospital and Fort Scott Community College—discussed options such as continuing to reach out to local churches who could volunteer their church vehicles as a short-term solution to the issue. A local pastor in attendance at the meeting said insurance is a key concern for churches since using them would not be considered church-related. Kevin Marvin and Lora Strong of Pitt-Taxi transportation services in Pittsburg also attended the meeting and explained how they began their company in 2012 with just one vehicle, since growing to include a number of vans and other vehicles. Pitt-Taxi provides rides to those within Pittsburg city limits at a set price for one-way and round-trip journeys. 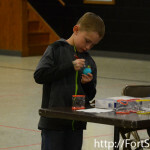 Marvin said they are interested in providing such a service in Fort Scott as well since they see a need similar to what they had previously seen in Pittsburg. “We’d be more than glad to get in here and shoot for the sky,” Marvin said, saying their company is flexible enough that they could make adjustments along the way to make it the right fit for the community. 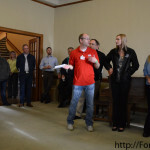 Marvin said their goal would be to bring one of their vans to Fort Scott two weeks before the SEK-CAP end-date of June 30, and use local drivers to provide rides from 6 a.m. to 6 p.m., Monday through Saturday. Unlike SEK-CAP, which required a 24-hour notice for rides, Pitt-Taxi could pick up customers within about 15 minutes of being called and said drivers are willing to provide some assistance to riders such as with groceries. Currently their vehicles are not wheel-chair accessible unless the chair folds and the rider is able to get into the vehicle with minimum assistance, due to insurance coverage. The prices would likely be the same as in Pittsburg, at $7 for a one-way trip and $10 for a round-trip, which requires no more than a 15-minute wait. At those prices, Marvin said they would need to provide an average of 20 rides per 12-hour day in order to break even. 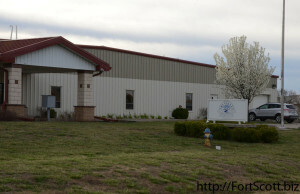 Because of their need to spread the word of their arrival as well as additional costs in payroll, a vehicle and added insurance, Marvin asked if the cost of rent for their Fort Scott office at the Bourbon County Senior Citizens’ facility could be waived for the first few months. 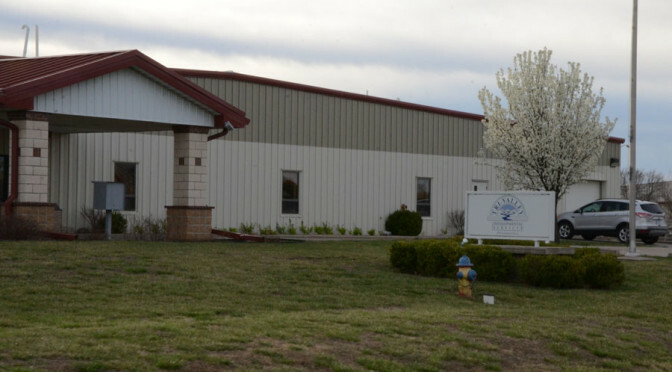 City Manager Dave Martin said the city of Fort Scott would provide $5,000 to the BCSC to be used for rent and utilities of that office until those funds run out. 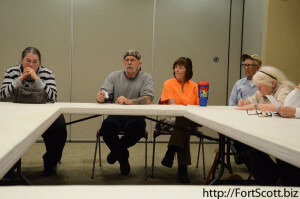 While bringing in Pitt-Taxi would solve the issue of losing public transportation in Fort Scott—which Deb Needleman emphasized is not a result of lack of funding, but because the current transportation has not fit the needs of the city—the committee said they will continue to look for other means of providing transportation for those who could not afford the fees or need rides at night. Vouchers and volunteer drivers are options. Due to the hard work of city leaders, Fort Scott could soon be seeing more projects and improvements being accomplished around town to better roads and sidewalks for travelers’ convenience. Already, work continues steadily on National Avenue between 6th and 13th streets, with the project expected to be done by August to improve the drainage and pipelines running along that roadway. 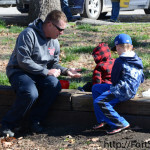 Earlier this month, City Manager Dave Martin said residents and travelers through the city will see even more work being done as the city uses grants and Kansas Department of Transportation funds to improve the streets and sidewalks. In upcoming weeks, a sidewalk project will begin on the south side of Wall Street between Margrave and Steen streets. 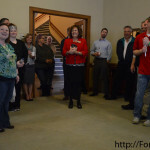 Earlier this month, bids came in on the project which will be accomplished with about $175,000 in grant money. “A lot of people walk on that street,” Martin said, adding there are other areas of town that are in need of sidewalk improvements as well. 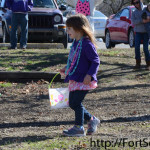 The city received a grant in 2014 to improve walking routes to Fort Scott schools by improving and connecting sidewalks, a project of almost $270,000. This Safe Routes to School grant will be used in the areas around the two elementary schools and should be put to bid in November as the city waits for approval from KDOT concerning easements and sidewalk locations. But improvements will be made for drivers as well as pedestrians in Fort Scott as the widening project of Highway 69 begins in the next month, with contractors already working to determine how to route traffic safely through the area while work is done. 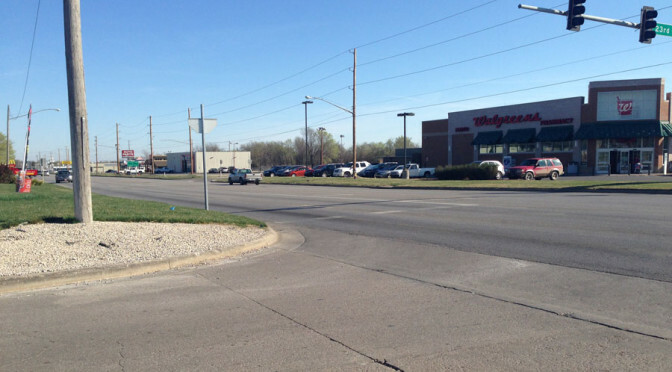 That project will be located between the National Avenue and 23rd Street intersections with Highway 69, with a traffic signal being added at National Avenue, the light at 23rd Street upgraded, a turning lane added and business entrances cleaned up. Because of the extent of the project, Martin said it will likely take a year to complete. “That’s a big project,” Martin said of the $3.5 million KDOT and Fort Scott project. 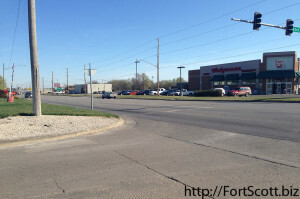 Similarly, north and south turning lanes and a new entrance will also be added at the Industrial Park on the south side of Fort Scott to improve traffic flow in that area, an issue KDOT became aware of after the addition of the LaRoche Baseball Complex. Martin said bidding will occur in 2016 for that $1.5 million project. “It makes it very stressful at times, but that’s a good thing,” Martin said of the work. Although several projects may be occurring simultaneously, Martin said in just a couple years’ time a significant difference would be made, and with the assistance of grants instead of just taxpayers’ money. In the meantime, drivers and residents in Fort Scott may have to be patient and remain aware of construction zones. 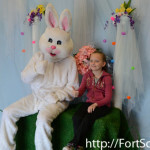 Despite the cold and wet start Saturday morning, Fort Scott businesses and organizations still provided festivities for families in honor of the Easter holiday. 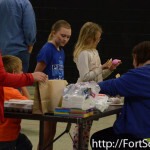 The Buck Run Community Center again provided their annual Easter Eggstravaganza, giving children an opportunity to color eggs, make crafts, try Easter snacks and participate in other activities. 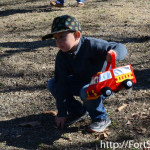 In just the first hour Saturday morning, about 30 children participated. 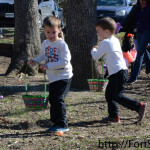 Director Tom Robertson said each annual event, which includes similar festivities for other holidays such as Christmas, Halloween and Valentine’s Day, brings about 40 children. 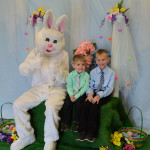 This year, the community center partnered with Walgreens, who provided free photo shoots with the Easter bunny at their location once the events at Buck Run were complete. Walgreens employees said usually between 50 and 75 people participate in such photo opportunities. 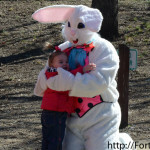 Though the weather was a concern, families still turned out in their Easter outfits to have their photographs taken with the Easter bunny. 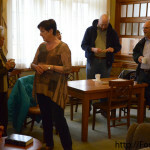 During this Easter week, the First Presbyterian Church hosted the weekly Chamber Coffee, informing attendees of their special services in honor of the Holy Week as well as other community events they participate in. 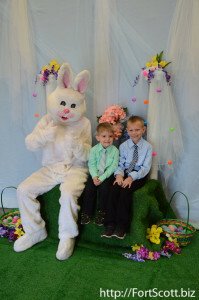 Pastor Jared Witt, who has been at the church for about four years, said the church added two services in honor of Easter, including one held Thursday in honor of Maundy Thursday, or the last Lord’s Supper, as well as a Good Friday service. A spirituality center is also available for anyone who would like to stop by at any point over the weekend. 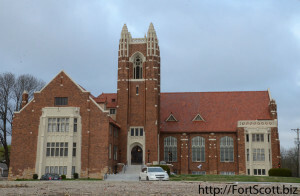 Throughout the year, Witt also explained that they take three weekends away from the normal church services and instead enter the community to do different service projects such as cleaning or construction work for the city, local organizations or elderly residents, with skilled workers of the church helping organize and lead the projects. 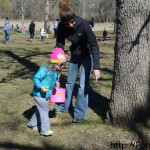 The next project day will be held May 22. While Witt said they likely have enough projects for that day, they will accept ideas for service projects for future work days. Witt said their elder-run church has seven staff members as well as a number of deacons, who lead the church’s compassion ministry, and elders, who help lead the church body. Currently, they are looking for someone who might be interested in taking on the position of youth minister. This week, a New York archivist is in town to help the Gordon Parks Museum get new prints of the Parks photos on display, which should soon be ready for exhibition once again. 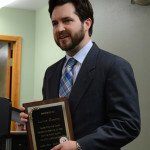 The Chamber of Commerce will hold their annual banquet March 31. The event is still accepting items to be sold in the live auction during the event. Musical artist Branford Marsalis will provide a concert at the Fort Scott Community College Thursday, April 7. Tickets at $30 apiece or $20 for students remain available. My Father’s House is in the process of considering expansions for their services such as by adding an emergency shelter and a thrift store as well as a vehicle. Members of the community who might have buildings they could donate or sell at a reasonable price are requested to contact My Father’s House. Work continues to be done on the Riverfront Project as local and out of town groups have participated in the project by picking up debris such as rocks and sticks. 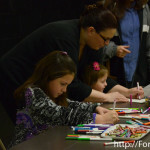 Groups are welcome to volunteer their services. The project is also currently waiting to hear if their applications for a lookout tower and shelter are accepted. The Sleep Inn & Suites hotel of Fort Scott was recently announced as a recipient of a prestigious 2016 Platinum Hospitality Award from one of the world’s largest hotel companies, Choice Hotels International, Inc., franchisor of the Sleep Inn brand. Platinum Award status represents a tremendous accomplishment for a hotel and its entire staff. Each year, only the top three percent of the hotels in the Sleep Inn brand are eligible to receive this elite distinction. 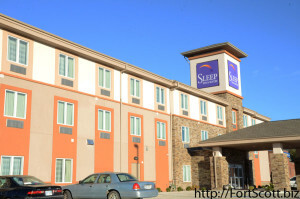 As a top performing property among the company’s more than 5,200 United States franchised hotels, the Sleep Inn – Fort Scott is among the top performers within their brand. As one of the company’s top franchised hotels operating under the Sleep Inn flag, the hotel has demonstrated an exceptional focus on guest satisfaction and dedication to providing superior service. Additional award criteria are evaluated by Choice Hotels through its official property ranking reports. 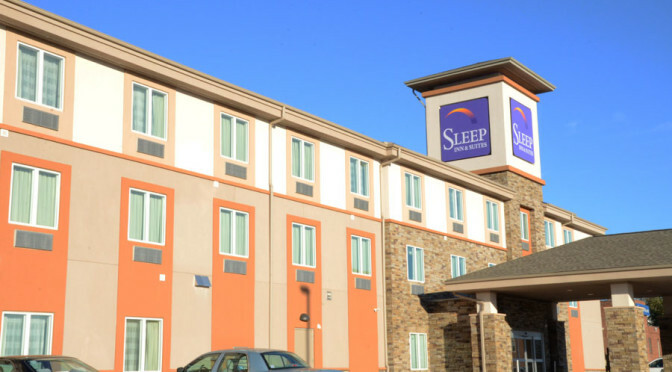 Sleep Inn – Fort Scott is a national leader within the brand as it has held a Top 5 ranking since it gained eligibility in October of 2015 and is currently ranked as the #1 Sleep Inn property in the US. For more information or to make your reservation today, visit www.choicehotels.com. 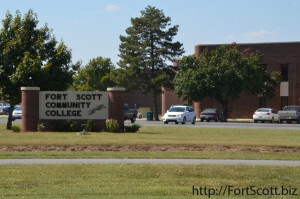 Fort Scott Community College will host its 40th annual Aggie Day on Friday, April 1. 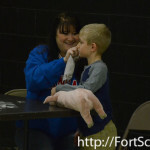 Approximately 1,400 students representing more than 80 schools will compete in the contest, which is facilitated by FSCC’s Agriculture Department. The department offers a variety of programs for students, including agriculture, farm and ranch management and John Deere Tech, as well as activities such as livestock judging, meat judging, collegiate farm bureau and rodeo. Students will compete in a variety of areas, including agronomy, entomology, farm management, floriculture, food science, livestock, meat evaluation, milk quality and products, nursery/landscape, poultry and speech. Trophies will be awarded to the top three teams in each contest. Plaques will be awarded to the top three individuals in each contest, and medals will be presented to those earning fourth and fifth place. Sponsored by Purina Animal Nutrition, Honor Show Chow and Winfield, this event is the longest running interscholastic competition in the region. 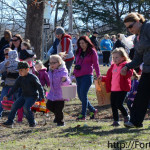 Teams should pre-register online at fortscott.edu/aggieday before Friday, March 25. 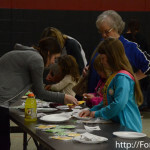 Registration for the event will begin at 7:00 a.m. on Friday, April 1, at the Arnold Arena on the FSCC campus in Fort Scott, Kan.
For more information, please call Ryan Edgecomb, FSCC Agriculture Instructor, at (620) 223-2700 ext. 3280. 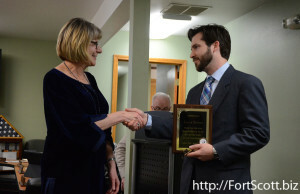 After announcing his resignation earlier this month, Fort Scott city commissioner Lucas Cosens was recognized Tuesday night during his final meeting before his family moves away to Cleveland so he can continue medical school. 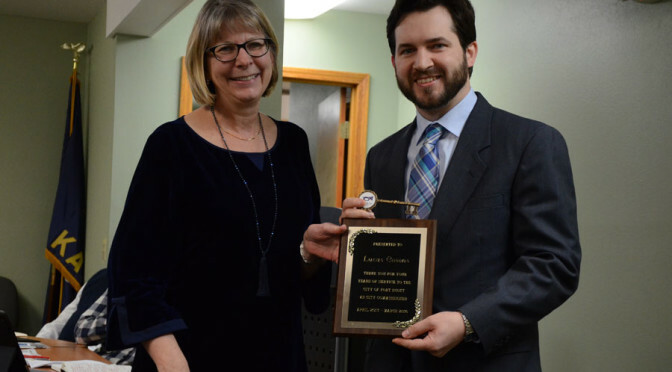 Mayor Cindy Bartelsmeyer presented a plaque and key to the city to Cosens, thanking him for his service to the community during his almost three years as a commissioner. City Manager Dave Martin praised Cosens, saying he was always willing to ask hard questions and hear both sides of an issue. 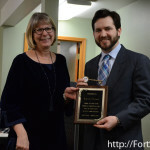 The city leaders wished Cosens well as he continues his medical education at Kent State University with the goal of moving from practicing as a chiropractor to more traditional medicine. “It’s been an honor and privilege to serve in this wonderful town,” Cosens said. Dr. Randy Nichols has been approached and considered to fill in the open position left by Cosens. The commission approved a low bid of less than $4,800 to replace three sets of fire fighter bunker gear to continue rotating through worn gear. The replaced gear will be used as back-up equipment. 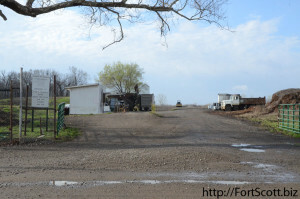 The commission approved water treatment plan supervisor Michael Mix’s request to go to bid for a new sludge tank as well as improvements to be made at the plant to correct the process of transporting dirt from the water to the wastewater plant, since that dirt can no longer be put back into the Marmaton River. Fire Chief Paul Ballou gave an update on Lake Fort Scott’s need for a tornado siren in that area. The lake community raised more than $5,000 through a memorial fund in honor of John Scott, who died in 2015, to help fund the project while the Bourbon County Commission decided Tuesday morning to also provide $5,000. The city will support the project as well, which will cost the entities a total of between $16,000 and $18,000. New Wave Broadband has offered to let the siren be located near their new tower at the lake, which would also provide the needed energy. 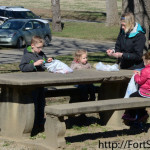 The city of Fort Scott has begun looking into the option of selling Second Street Park, citing reasons such as the number of parks already owned by the city, the small number of people who use the park, the number of times the police department is called to that area as well as the fact that the area floods. Martin clearly stated they are moving forward slowly and are looking for feedback from the community on the idea. The commission approved increasing their annual donation to the Bourbon County Court Appointed Special Advocates (CASA) from $2,000 in 2015 to $2,500 this year. 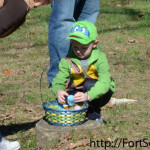 Despite a cool start to the day, the weather warmed nicely for families and volunteers participating in the Fort Scott Kiwanis annual Easter egg hunt held at Gunn Park Saturday morning. “I thought it was a decent turnout,” Phil Gorman, Kiwanis club treasurer, said of the event that has been held for decades. 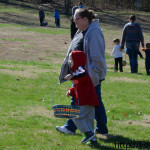 About 200 children, divided into three age groups, hunted for about 2,000 eggs that had been placed earlier that morning. 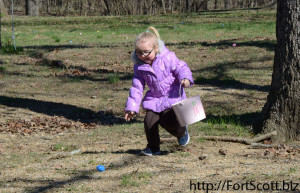 While some eggs had candy in it, some held coupons to businesses around town such as Fort Cinema and local restaurants while others signaled that they had won a different prize. 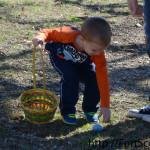 Quinten Irsik, 4, was awarded the grand prize for finding a specific egg. 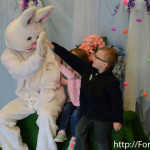 Gorman said they would not have been able to put on the event without those business that donated coupons as well as funds that were used to purchase the eggs, candy and prizes. Those donors included individuals and entire businesses representing Farmers Insurance Group, Iron Star Antiques, Farm Bureau Insurance, Rogers Body Shop, Heidricks True Value, Don’s Spirits, R & R Equipment, Big Sugar Lumber, Fort Scott Lumber, Dairy Queen, Diehl Banwart Bolton CPAs, Flowers by LeAnna, Marsha’s Deli, McDonalds, Edward Jones, Liberty Theater and Country Cupboard. 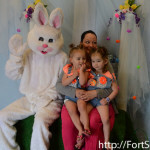 The Fort Scott Police Department also participated in the event Saturday and the Easter Bunny was also present for photo opportunities. 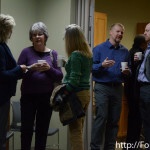 During the weekly Chamber Coffee Thursday, Tri-Valley Developmental Services provided an update on the services they provide to Bourbon and neighboring counties as well as upcoming events and fundraisers they are holding this spring. The non-profit organization began in 1975 with families interested in providing services to those with disabilities that hinder them from participating in the community, when their only option was to stay with family members or go to the state hospital. Since that beginning, Tri-Valley has served Bourbon, Neosho, Woodson and Allen counties by providing services to those individuals through transportation, day services, residential care, employment services, horticultural therapy and case management. Executive Director Tim Cunningham said they currently serve more than 200 people across the four counties. 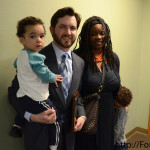 “We’re involved in every aspect, 24/7, of the people we serve’s lives,” Cunningham said. Cunningham said their organization has faced financial difficulties because of the economy, which led to cuts in their budget and number of employees. 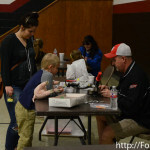 But they continue to provide services with help from fundraisers such as their upcoming, 3rd annual Cruise Night Event, April 12, with will include dinner and prizes as well as live and silent auctions for $45 a ticket. Their goal is to raise $25,000 that evening. Tri-Valley is also selling $50 raffle tickets for a drawing on June 24th, when they will be giving away a 2016 Ford F-150 Platinum. The funds from each of the fundraisers will go towards sponsoring homes Tri-Valley provides. “We definitely appreciate everything that you guys do in the community,” coffee hostess Gina Shelton said. 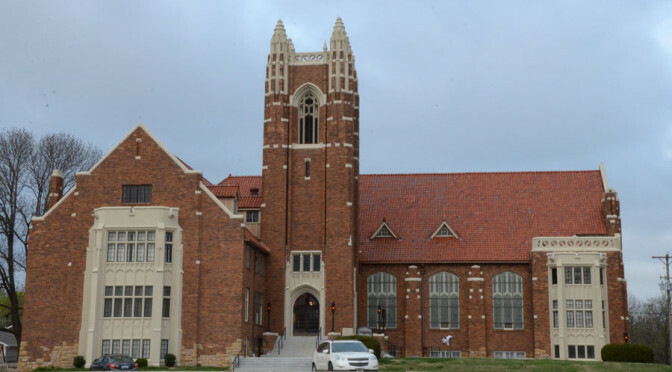 The Knights of Columbus will be hosting their final fish fry of the Lent season Friday evening, from 5 to 7 p.m., at the Kennedy Gym. 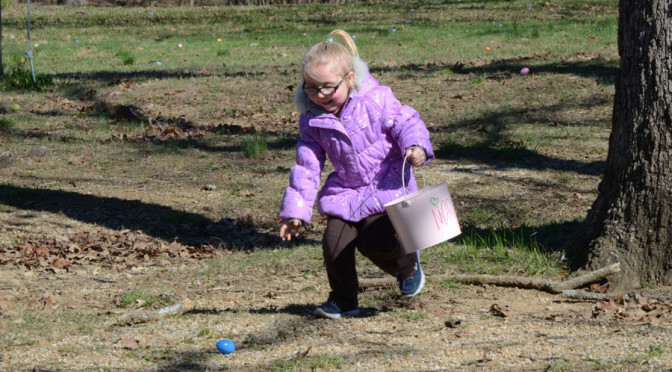 The Pioneer Kiwanis will host an Easter egg hunt at Gunn Park Saturday, with the hunt starting at 11 a.m.
On Good Friday, the Life Point Assembly of God church will host a service in partnership with other area churches, while an Easter sunrise service will be held at the downtown gazebo. 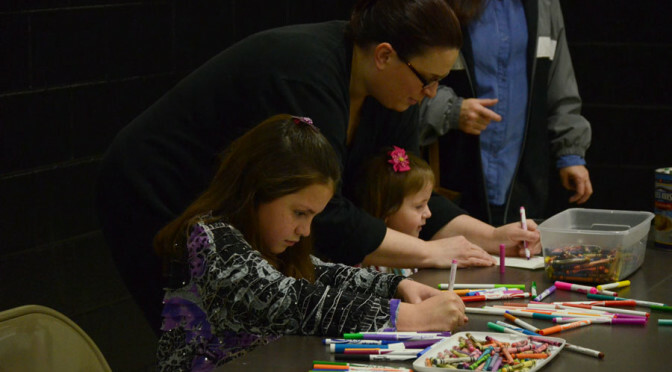 The 2nd Story Festival of Arts and Ideas will be held in Fort Scott, April 8-9, with numerous hands-on activities available as well as guest speakers. The Lowell Milken Center for Unsung Heroes continues to sell bricks for $100 each for a fundraiser for the Unsung Heroes Park located next door to the new building. The names of sponsors will be engraved on those bricks which will be placed in the park. 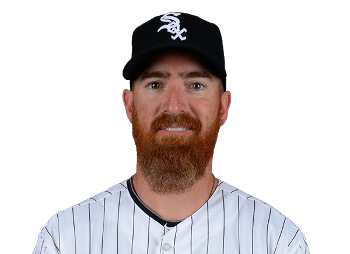 During a surprise statement Tuesday, Fort Scott graduate and resident Adam LaRoche announced his intentions to retire from Major League Baseball after 12 seasons of playing. The first baseman and designated hitter signed a two-year contract with the Chicago White Sox during the 2014 off-season, but told his coaches and fellow players Tuesday, with just over two weeks before the 2016 season starts, that he intends to retire from the game, citing personal reasons. By voiding the contract, he would walk away from the contract’s remaining $13 million promised him for the 2016 season. A follow-up MLB article published Wednesday stated LaRoche signed retirement papers, though the club had not yet sent them to the league office, granting him a little more time to decide. That article said LaRoche decided to retire when the club requested that his son Drake, 14, not spend as much time with him and the team as he had in past years. Drake had become known as the 26th man on the team, having his own locker at the ball field and being a constant presence with the team during practices and games. The White Sox executive vice president Ken Williams, who made the request, said the club did not wish to set such a precedent, though adding the team was fond of the teenager. Other MLB players such as Bryce Harper of the Washington Nationals expressed support for his family-focused decision on Twitter. LaRoche has a career batting average of .260 with a total of 255 home runs over 12 seasons with teams such as the Atlanta Braves, Pittsburgh Pirates, Arizona Diamondbacks, Washington Nationals and the Chicago White Sox. His average statistics dipped during the 2015 season when he batted just .207 with 12 home runs, both his lowest in the majors other than an abbreviated 2011 season that ended when he had shoulder surgery. LaRoche played in just two spring training games this month as back spasms during the first week of March forced him to rest. 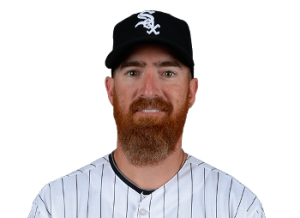 LaRoche and his wife Jennifer and children Montana and Drake are Bourbon County residents at the E3 Ranch and active members of the community, such as by investing in the LaRoche Baseball Complex. LaRoche is also a co-owner of the hunting show “Buck Commander” along with other athletes and celebrities. With the busiest of the tornado and storm season ahead, Bourbon County commissioners and attorney Justin Meeks discussed the need for tornado sirens in areas of the county during their meeting Tuesday. Emergency Director Will Wallis informed the commission that the city of Fort Scott has nine sirens while other areas such as Bronson has two, Uniontown has two, and others such as Fulton and Mapleton have one in their areas. 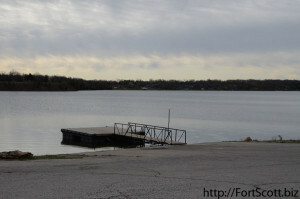 Other areas such as Redfield, Hiattville and likely Garland do not have sirens, as well as Lake Fort Scott. “We live in a very volatile area when it comes to storms,” Meeks said. 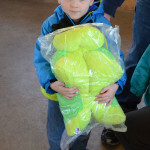 After the death of John Scott in May of 2015, a memorial fund was set up in his honor to raise funding to purchase a tornado siren for the Lake Fort Scott area. 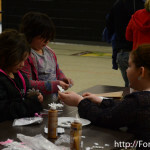 About two-thirds of the needed $17,000 has been raised, and residents of the area asked if the county could provide the remaining approximate $5,000. 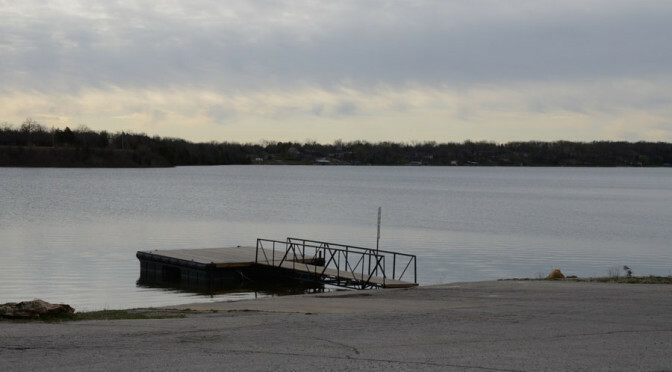 Because Lake Fort Scott and other areas such as Hiattville and Garland are unincorporated, they are unable to seek grants to pay for the sirens, such as other areas like Bronson, who recently paid for sirens with grants. Commission Chairman Barbara Albright said the county has an opportunity to assist a community that has a safety issue, but Meeks pointed out that, by doing so, the county would be setting a precedent they would need to follow consistently in future years when requests come in. Meeks said they could create a budget line item annually that could be used to help other communities in a similar way in future years, focusing on safety issues such as sirens as opposed to other projects that fit in the current, parks and recreation item. “I have some mixed feelings about that,” commissioner Harold Coleman said, saying he does not like the idea that the rest of the county is helping pay for a tornado siren for one area. With such a tight budget already, the commissioners decided not to commit to an action at the moment that would require a budget item of about $5,000 each year. “Once you start down that road you have to be consistent,” Meeks said.